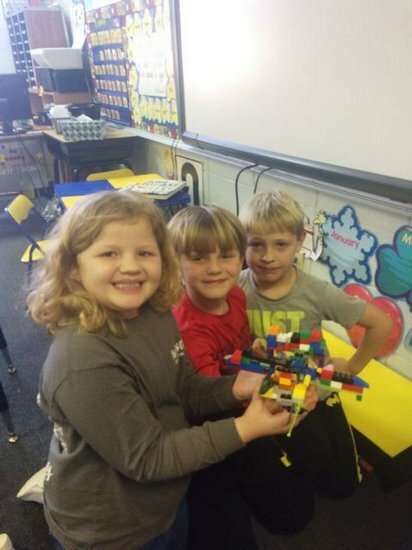 Laura Beth Dixon, Samuel Kelley, and Mason DeBaise are shown proudly displaying a portion of their construction. Southland Academy first graders recently observed the 100th day of school with lots of fun activities. 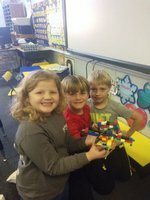 One of the students' favorite activities in Mrs. Peggy Roquemore's class was a Legos challenge. Each team of students had 100 random Lego bricks with instructions to apply their creative building talents. The enthusiasm and competitive spirits were fierce during the STEAM related activity.